Only the Northern XC results this week as far as I know. 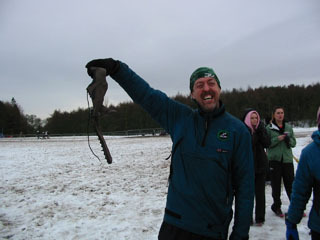 Well done to the hardy and brave souls who tackled winter conditions at Knowsley on Saturday afternoon. Jane and Jenny had brilliant runs in what looked like very tricky situations to both finish in the top half of an outstanding field of talent and I believe they had a very close race all the way which is always good to see. Massive congratulations also to Nesta in choosing a difficult cross country race to enter as her first foray. As always she did everyone at Helsby proud. Senior ladies race was roughly 8k. Steve Riley, first in for Helsby, can be seen enjoying himself thanks to Dave Pinnington who was out on the course taking photographs many of which have already appeared on his website. Senior men’s race was a strength sapping 12k. Andy with the one which tried to get away – Moral : even if you are up for the race, check that your shoes are too if you want your race to last more than five minutes. Nesta killing it in her very first XC! Thanks also to support on the day from Joe and Mario too, sorry if I’ve missed anyone but I wasn’t able to get there on the day to support. 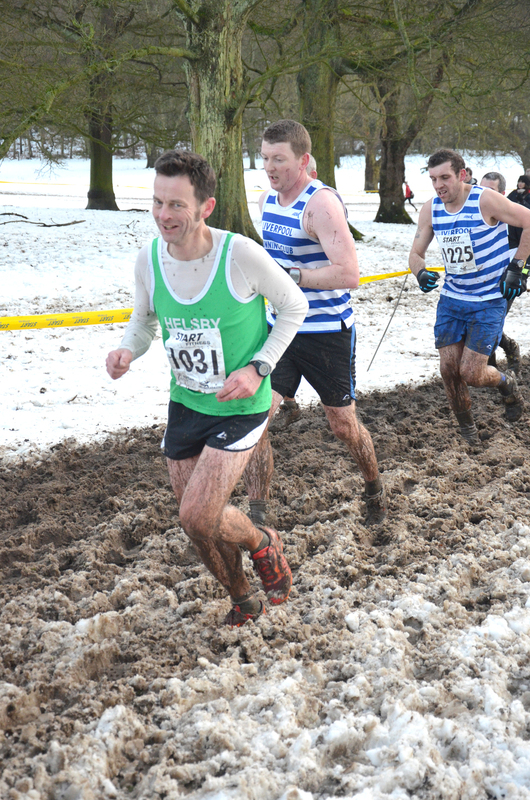 The final cross country is Sunday 10th February at Clarke Gardens, Liverpool, a course we have run with the Northwest league but this race is with the Liverpool & District league. Once I have a list of names we’ll need someone to take a cheque on the day to Clarke Gardens as I’ll be fell racing this particular weekend at the Tarren Hendre fell race so also unable to make that particular cross country race. The Liverpool & District Cross Country Union Championships will be held at Clarkes Gardens on Sunday 10th February 2013 with an 11am start. I would be grateful if you would submit entries to me in excel format and include dates of birth (not age category) no later that Monday 4th February 2013. No guests or second claim athletes are allowed to run in the championships. Directions are now online for this weekends 5th Border League race which is at Holyhead on Sunday. The race, as normal, will be at 11.00am and due to the distance I’d suggest car sharing wherever possible. AA Route planner from Helsby is suggesting a 1 hour 50 minute journey time. A map of the course can be found at: http://www.angleseycircuit.com/information/circuit-map. loops of the ‘International Circuit’, funnelling off into the Pit Lane to finish. If the wind is kind to us it promises to be a fast course. Training is still ongoing at Castle Park Monday nights at 6.30pm so will be good to see you there, everyone and all abilities welcome. Obviously it was a disappointment this weekend that the popular Helsby Half Marathon didn’t go ahead but there is still a result to send out! Well done to Andy on a fine achievement after coming back from injury. It was the 4th Border League of the season on Sunday, the roughly five and half mile four lap tour of Birkenhead Park. Luckily the weather was kind (although cold), with great support as usual from Joe, Mario, Jane, Sharon from Tattenhall and many others from different clubs. Good race for supporters as they can see the race unfold due to the design of the course. The race was organised by Birkenhead so many thanks to them. Great turnout for Helsby men with 14 green vests which gave us a really good score for the team results, well up in Division Two for the day in third place….is it too early to start talking possible promotion next season? Great runs from Colin Bishop and Albert Berry saw them both first place in their respective categories. Well done. 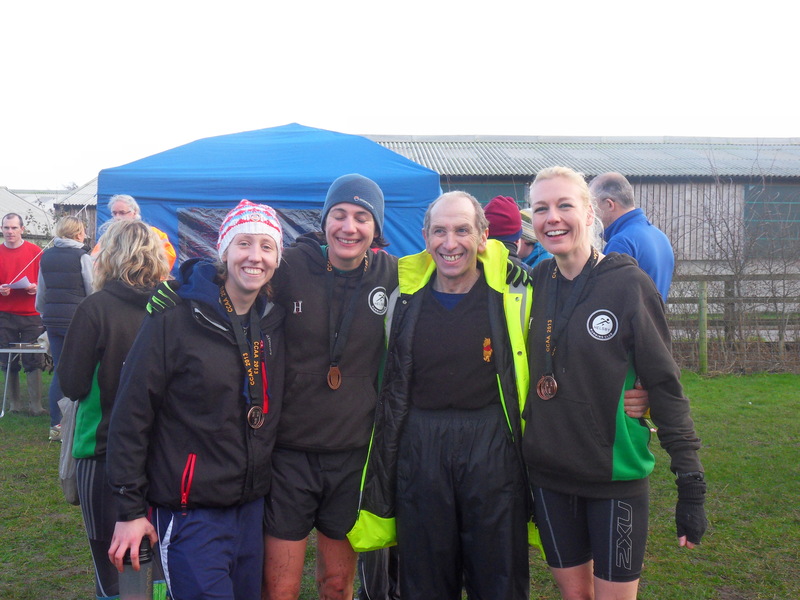 Three ladies out with the Helsby vest, with great races individually, Jayne 2nd in her category and 3rd overall and Laura in 7th( fantastic results if this is her first Border League outing?) but it made a big difference to the ladies team score not having the 4th counter. For a small club we do very well (as shown in the cross country) so with three more races to go Helsby ladies will pull that back. Well done also to Colin Thompson and Tom De Jong running so well after competing in a 5k Park Run on the previous day, which also saw Tom secure a new PB. Fantastic effort guys. The next Border League is in Holyhead Sunday 3rd February normal time of 11.00am, so maybe there will be less out from other clubs, a good time to consolidate positions in the league for team scores if we can get the numbers there. Unfortunately I will apologise in advance as I’ll be away in Ireland for a wedding on this date. Details and directions will appear on the Border League website soon. If I don’t see anyone this week good luck to all running the Helsby Half this Sunday and thanks in advance to those helping on Saturday and Sunday. Well done to Gareth Boyd for a sub 3 hour 30 marathon on New Years Eve. That’s one way of earning a pint. ‘Despite being repetitive (4 laps of the prom) and being rather wet and windy – This was a really good race. It was local, low key, friendly and is defo a PB course. Approx 100 runners competed – with great camaraderie throughout. It was fantastic to even get some support/clapping from passers by along the route – although, I’m sure one passer by did mutter the words “you’re just showing off” during lap 3!? I’m informed that I did confuse some people (as I headed towards the finish ‘looking like the leaning tower of Pisa’ ) by running past the finish line, not stopping – running on for another 15 metres of so, before running back to the finish line -then running past the start/finish line and then heading back just to ensure I’d reached 26.2 on my garmin. Admittedly, this may have looked a bit strange…..
New Years Day was the Thornton Hough to Willaston Charity Race of 3.5 miles. All profits go to the Wirral Autistic Society with goody bags sponsored by Levers. Joe and Mario were there to offer support and great run from Jayne securing 2nd lady and Adair 5th overall. No results for this one though as fairly low key although does attract just under 100 runners, many from local clubs. Hopefully see many of you on Saturday or Sunday this weekend for the two XC races.